Globalization has important implications for the organization of labour markets. Until quite recently, the world of work has been shaped by local and national factors. At least since the Second World War, the level of employment has been a major consideration influencing the policies of national governments. The quality of employment depended on the sectoral distribution of production and the behaviour of individual firms with respect to wages, working conditions and training programmes, albeit in the context of wider government policies relating to the labour market and education and training. Most people, at least in the developed countries, expected a lifetime’s employment, if not in the same company, then most likely in the same locality or country. Trade union and employer organizations bargained within an established framework of national industrial relations. All that is now changing under the pressure of globalization, as the increased mobility of capital meets the more location-bound asset that is labour. The conditions underlying firm-level competitiveness are changing, relying less on traditional natural assets and more on created assets, above all assets in the form of skills and knowledge. Such assets are therefore an important factor influencing the locational advantages of countries as hosts to TNCs. The importance of skilled human resources, as well as the proliferation of cross-border production linkages via FDI, subcontracting arrangements and strategic alliances and the adoption of complex integration strategies by TNCs create both challenges and opportunities for mutually beneficial relations between employers and employees. As the organizational scope of TNCs widens, both geographically and functionally, and as the mobility of capital increases, labour and governments must adapt more quickly to changes in the international competitiveness of their industries and firms. Increasing reliance on market forces redefines the relationships of firms, labour and governments with one another, including those in the areas related to employment and the workplace. In addition, the recent increase in unemployment has refocused the attention of policy makers on the links between TNCs and the generation, location and upgrading of jobs. Although the fundamental factors underlying current unemployment problems relate to macroeconomic and structural imbalances in developed countries and resource constraints in developing countries, TNCs, as a major force in the internationalization of economic activities, influence the quantity and quality of jobs available worldwide. Their influence is particularly important in manufacturing and services and, within these, in certain industries and countries. In all these respects, the influence of TNCs on labour markets and workplace conditions is, of course, not independent of established industrial relations practices. As a direct result of these changes, labour markets and industrial relations are beginning to emerge slowly from their national confines and to adapt to a world economy that, in other respects, is more integrated than at any time in its history, and is becoming progressively more so. Transnational corporations are estimated to employ some 73 million persons at home and abroad (table 8). Although this represents only around 3 per cent of the world’s labour force, employment in TNCs accounts for nearly 10 per cent of paid employment in non-agricultural activities worldwide, and close to 20 per cent in developed countries considered alone. In addition, the indirect employment effects of TNC activity are at least equal to the direct effects and probably much larger. Backward linkages, such as the purchasing of raw materials, parts and components from subcontractors and external suppliers, are among the principal channels whereby TNCs can indirectly contribute to employment generation. The importance of these effects has grown in recent years, as firms have progressively focused on smaller but higher-value segments of the production process, relying increasingly on national and international outsourcing for technological, cost or flexibility reasons. An example is the footwear company Nike whose core staff consists of 9,000 persons, but, through subcontracting, employs an additional 75,000 (box 1). Overall, however, it is estimated conservatively that each job in a TNC generates at least one additional job elsewhere in the economy. Thus, at a conservative estimate, the total number of jobs associated with TNCs may be placed at 150 million at the beginning of the 1990s. 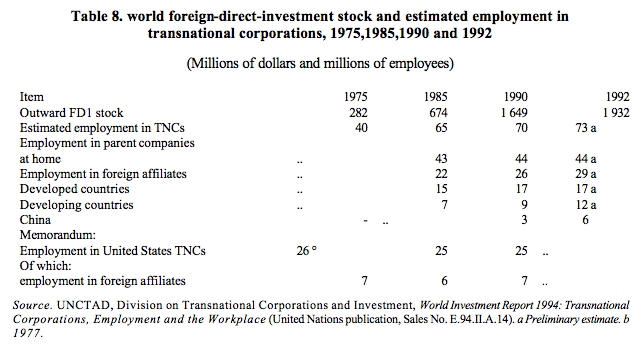 As world FDI stock expanded during the 1980s and early 1990s, the total number of persons directly employed by TNCs at home and abroad increased as well, though at a considerably lower rate. The reasons include a trend towards capital deepening and labour-saving technologies, the spread of national and international subcontracting arrangements that generate employment in outside TNCs, and efforts by TNCs to reduce costs through rationalization and employment downsizing. In fact, total employment in a large sample of the top industrial TNCs at the end of the 1980s was lower than in 1980, and it is likely to have declined further since then. However, when all TNCs are considered, total employment in TNCs has grown somewhat . … and employment in foreign affiliates rose, particularly in affiliates in developing countries, compared to that in parent firms. Parent corporations account for nearly two-thirds of total direct employment in TNCs. However, during the 1980s and early 1990s, the limited growth that took place in direct employment in TNCs was concentrated in foreign affiliates. For example, employment in United States parent TNCs fell slightly during 1985-1990, while that in their foreign affiliates rose during the same period. In the case of Swedish manufacturing TNCs, employment at home declined sharply during 1986-1990, while that in foreign affiliates rose, resulting in an increase in the share of foreign affiliates from 41 per cent to 61 per cent of total employment. Particularly significant was the growth of employment in Japanese foreign affiliates, which more than doubled during the second half of the 1980s. 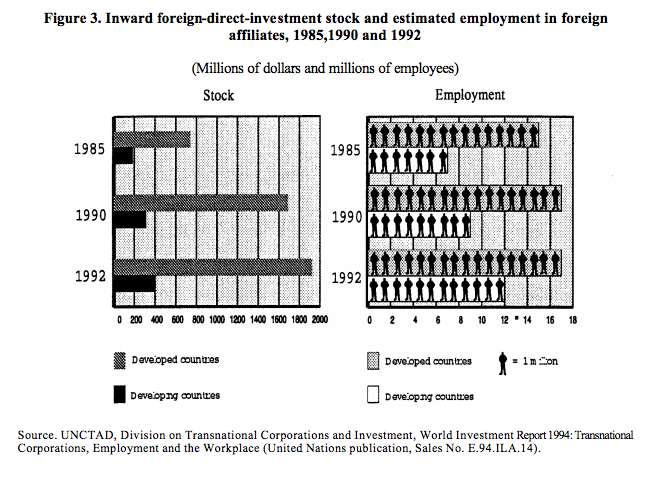 When it comes to the distribution of the growth of employment in foreign affiliates, those in developed countries are estimated to account for a somewhat smaller share of the moderate increases that took place between the mid-1980s and the early 1990s, in spite of the high absolute amounts of FDI flows to, and stocks in, these countries (figure 3). One of the reasons for this is the pronounced sectoral shift of FDI towards services where one FDI dollar is associated with perhaps only half of the jobs associated with one FDI dollar in manufacturing. Furthermore, a restructuring and consolidation of corporate networks has often led to a reduction in employment. However, in spite of slow growth in foreign affiliate employment in developed countries due to these factors, foreign affiliates account for about 3 per cent of paid employment in these countries, with this figure rising to 10 per cent or more of manufacturing employment in most developed host countries. The greater part of the increase of employment in foreign affiliates in recent years has taken place in developing countries, rising from 7 million in 1985 to an estimated 12 million in 1992. But the picture is quite uneven with respect to the distribution of foreign affiliate employment and its growth among host developing countries, in general reflecting disparities with respect to the pattern of FDI flows. A considerable share of the increased employment was concentrated in East and South-East Asia, in particular China, and in export processing zones in that region and elsewhere. Still, the level of foreign affiliate employment remains low in most developing countries. With the exception of small countries, such as Singapore, Jamaica or Botswana, the share of employment by foreign affiliates is 2 per cent or less of total employment. However, the figures hide the fact that TNCs are concentrated in modern manufacturing industries with implications for economic growth, long-term employment generation and employment quality. Indeed, TNCs account for one-fifth or more of total paid employment in manufacturing in a number of developing countries. These figures do not say anything about the qualitative aspects of employment in foreign affiliates, be it in developed or developing countries. To begin with, the workforce directly employed by foreign affiliates typically – but not always – enjoys better wages, conditions of work and social security benefits relative to those prevailing in domestic firms. The explanatory factors include the size of foreign affiliates and their tendency to be concentrated in more capital- and skill-intensive industries and the importance of skills and quality of work for generating competitive advantages. Thus, TNCs have the potential to exert a positive qualitative influence on wages and working conditions in host countries. Particularly in developing countries, the higher wage levels in foreign affiliates are likely to be an influence for raising wages, at least of certain kinds of labour. When it comes to other conditions related to work, TNCs generally adopt standards that are not less favourable than those of comparable national employers and are sometimes above the national average. … and human resource development. Perhaps even more importantly, TNCs often provide labour with the opportunity to acquire additional knowledge and skills, and this is particularly so in the case of affiliates operating in developing countries. Indeed, the essential characteristic of TNCs is that they bring together in the workplace international knowledge and skills with the human resources present in a particular location. Accordingly, host country employees and the host economy as a whole can benefit from the upgrading of skills already possessed through employment in TNCs and, especially, the acquisition of new vocational and management skills through formal and on-the-job training in foreign affiliates. The major role of TNCs in human resource development stems from the learning opportunities and training that they provide for their employees. The extent and nature of training varies according to the country, industry and activity in which a TNC is engaged, as well as firm-specific strategies with respect to FDI and human resource management. On the whole, TNCs provide at least as much, if not more, training for their workers in developed and developing host countries as domestic firms. Because of their size and international character, TNCs are able to offer formal and non-formal training programmes that are, in some respects, better than those provided by many domestic firms, especially in developing host countries. Larger TNCs often establish training centres and use in-house or external expertise to provide off-the-job training for their employees. Large, as well as small and medium-sized TNCs send affiliate employees to their operations in the home country for experience and training on the job, while large TNCs also rotate managerial staff to different locations for learning. Another channel for the transfer of skills that TNCs typically use is expatriate staff. Human resource development through training is particularly important in the more sophisticated manufacturing activities and in service TNCs where training is a principal channel for the transfer of soft technologies. The transnational structure and the large size and scope of many TNCs thus hold a distinctive potential for the development of the skills and knowledge of their employees and the further dissemination of those capabilities in an economy through backward and forward linkages. Realizing the potential depends, however, not least on the human resource capabilities that a country already has. The reason is that the ability to attract FDI, particularly into industries and activities that involve human capital investments by TNCs, depends to a significant extent upon the availability of an educated and skilled labour force ready to absorb new skills, know-how and knowledge. Countries in which the level of education and skills is sufficient to provide TNCs with the labour quality that they seek are, therefore, likely to attract such FDI inflows. In addition, as TNCs move – either on the basis of labour-market conditions or as a result of other reasons towards higher skill-intensive activities, the availability of an educated and skilled labour force becomes a condition for sustaining the shift of TNCs into activities with greater potential for human resource development. A virtuous circle of interdependence can be set in motion, with positive results for labour, TNCs and the host economy. Decisions affecting the quantity and quality of employment in TNCs are the responsibility of management. But these decisions are not taken in isolation. Trade unions – in the context of national industrial relations systems-continue to be important to articulate, explain and present workers’ views to management. However, there has been, particularly over the past decade, a tendency for management to take up certain employment issues in the context of human resource management, thus removing them from the domain of collective industrial relations. The expanding influence of TNCs over domestic economic activity is accompanied by perceptible changes in industrial relations practices, both within TNCs and in industrial relations in general. The central characteristic shaping the relationships between trade unions and TNCs is the difference between the international organizational scope of TNCs on the one hand and the mostly national scope of labour organizations on the other. Within this basic asymmetry, the greater flexibility of TNCs to shift productive assets assumes particular importance because the real or perceived threat to relocate production can have implications for the effectiveness of unions, first to organize themselves and then to take action. This may be further exacerbated if governments seeking to attract FDI see trade union presence as a possible deterrent to foreign investors. Another aspect of the transnational character of TNCs is that their decision-making processes are often more complex than in purely domestic firms. This makes access to information and to ultimate decision makers more difficult than in the national context. On the other hand, the growing interdependence of national units constituting corporate networks makes them more vulnerable to disruption by union action. While the issues that arise out of the differences in the organizational scope of TNCs and trade unions are real, it appears that they do not play a dominant role in day-to-day interactions. Industrial relations practices have, historically, been designed and implemented at the national level, often in close association with governments, although there are signs suggesting that the scope for national systems of industrial relations to determine autonomously labour practices and bargaining relationships is becoming more limited and that TNC based industrial relations structures are becoming more important. Still, in most instances, TNCs have adapted their own practices to host country norms. Furthermore, the long-term strategies and structures of TNCs are, on the whole, not determined by considerations relating to trade unions and, hence, do not necessarily always change when there are (temporary) disagreements between management and workers. In fact, motivated by their self interest, TNCs normally recognize unions (indeed, unionization often appears to be higher in foreign affiliates than in domestic firms), invest in their workforce and deal with trade unions with a view towards establishing effective relationships . … but also opens new avenues for cooperation. Such relationships have become all the more important as the pressures of competition require that firms need to “reinvent” themselves continuously through the introduction of innovatory practices and corporate restructuring. Often these require the formal or at least informal cooperation of organized labour to be effective. Perhaps more profoundly, the growing importance of created assets and the adoption,by many TNCs, of flexible production methods and new organizational paradigms increases the need for workers’ commitment to the performance of the firm. Such a need can be best sustained in the framework of a cooperative approach to industrial relations. As a result, employees are increasingly recognized as important stakeholders in the enterprise, with a strong interest in ensuring its success. While there may be disagreement about how this is best achieved, how the benefits of success should be shared, how unions may be involved and how national systems of industrial relations may be affected, one effect of expanding integrated international production is the recognition that all employees have much to contribute to the well-being of the enterprises in which they work. Growing acceptance of this view may permit the development of new cooperative arrangements for the conduct of industrial relations within TNCs. Foreign direct investment is often associated with a process of structural transformation in host economies, a transformation that may be expected to generate growth and hence employment in the long term. As part of that process, the rise of international production is associated with a certain redistribution of jobs, especially at the regional level, and an increase in the speed of the broader process of industrial restructuring that is taking place on the global level. On the whole, however, the number of jobs relocated from developed to developing countries through FDI is small, compared with the size of the total labour force in developed countries. The reasons are varied. To begin with, services account today for a substantial share of FDI flows to developing countries; given the (still) limited tradability of most services, most FDI in this sector is therefore by necessity location-bound, i.e., markets (domestic and international) cannot be served by trade. Other market-oriented FDI also typically does not lead to a relocation of jobs, e.g., when barriers to market access make it difficult, if not impossible, to serve certain markets through trade. Moreover, although labour costs are important for certain activities in certain industries, they are not, by themselves, among the most important determinants for the location of FDI. Furthermore, differences in labour costs between developed and developing countries are, to a certain extent, offset by corresponding differences in labour productivity. Finally, despite a few notable cases, TNCs do not often close down, on account of labour-cost considerations alone, production facilities in one country to re-establish them in another country; rather, to the extent that a shift in production occurs, it typically involves an incremental process in which new production facilities are established in developing countries or countries of Central and Eastern Europe. Broader and more important macroeconomic and cyclical factors, technological change and labour-market inflexibilities are the principal influences on the growth and distribution of employment . … governments seek to influence FDI to gain or maintain jobs. Nevertheless, given the unemployment problems facing most countries, it is a frequent objective of governments in developed as well as developing countries to retain or attract TNC operations with a view to maintaining or adding to jobs available. In fact, competition for FDI may tempt governments to offer concessions in the social and labour fields as an incentive to attract TNCs and to create much needed jobs. This reflects a genuine policy dilemma faced, in particular, by developing countries, between the need to create jobs and the need to raise labour standards. Policy formulation in this respect should recognize the complex factors determining employment and go beyond simple measures for attracting additional FDI inflows per se or, in the case of home countries, discouraging outward investment. In the current context of growing global competition and integrated international production, the key policy issue is how to attract or retain valueadding activities in a way that maximizes the long-term contribution by TNCs to national production capacities while maintaining desired local employment levels. Home countries need to recognize that, barring a major reversal of policies, globalization is a firmly entrenched process which, to an increasing extent, is becoming a parameter of national economic development. Foreign direct investment is an integral part of this process and is often a precondition for firms to preserve or expand international markets; not to undertake it could, therefore, lead to a loss of competitiveness. Today, the capacity to organize activities in an integrated way across different countries is a critical element in ensuring the efficiency and competitiveness of firms and, hence, their capacity to generate employment. The implication is that it may be better for home countries to ensure the competitiveness and eventual survival of their TNCs by encouraging them to focus on higher value-added activities than risking that they become less efficient producers. To be sure, the structural adjustments that this implies may be socially disruptive and entail substantial costs, especially for less-skilled labour. Governments will wish to ensure that these costs are minimized. Human resource development policies, especially retraining, have an important role to play in this respect. Policies designed to slow the pace of the adjustment process may facilitate the transition but, at the same time, may create other hidden or overt costs; efforts to steer the adjustment process require therefore a careful analysis of the costs and benefits involved. The employment effects of globalization make themselves felt not only at the aggregate level but also at the firm level. In particular, complex strategies have implications for the quantity, quality and location of the jobs generated by TNCs and the relations of these firms with trade unions. While the shift to complex strategies may lead to some decline in direct employment within the TNCs concerned, it also increases the opportunities for host countries to receive more and higher value-added FDI. Furthermore, as TNCs locate higher value-added and more specialized activities in their foreign affiliates, training requirements to improve the quality of host country personnel increase. 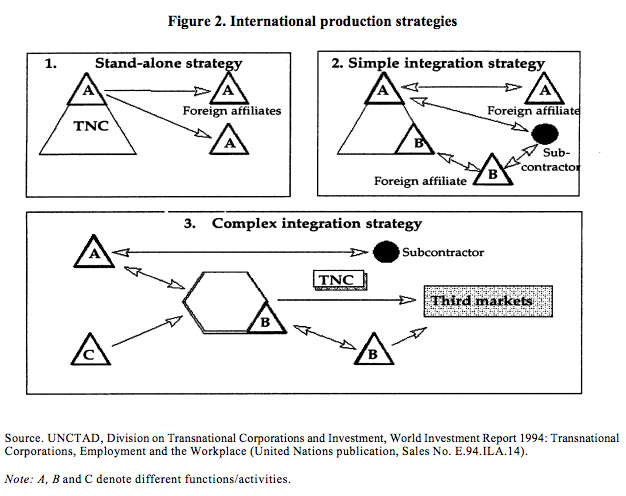 The trend towards complex strategies, therefore, suggests that integrated international production reinforces the higher wage/high skill profile of foreign affiliates. Thus, important employment effects of FDI derive from the way in which value-adding activities are structured and integrated within the production networks of TNCs. Growing recognition of these positive effects has contributed to increased competition among governments for FDI. In this respect, enhancing the quality of the labour force is likely to be a main avenue for policy action by developing and developed host countries to attract FDI. Human resource development is, indeed, within the realm of influence of local or national policy makers. It should be noted, however, that this maybe a necessary, but not a sufficient condition to attract FDI, among other reasons, because the supply of highly skilled human resources is growing across locations. Moreover, TNCs are most likely to be attracted by a combination of an educated labour force and a social and physical infrastructure capable of generating high productivity, especially in large and expanding markets. Globalization has important implications for the organization of labour markets. Quantitatively, employment in 77VCs has grown more slowly than FDI worldwide... ... and employment in foreign affiliates rose, particularly in affiliates in developing countries, compared to that in parent firms. Qualitatively, foreign affiliates can make a contribution... ... both in terms of working conditions ... and human resource development. Although industrial relations practices continue to frame workplace issues in TNCs... ... the transnational organization of production poses special challenges for nationally organized labour ... ... but also opens new avenues for cooperation. Although the relocation of jobs through FDI is limited ... ... governments seek to influence FDI to gain or maintain jobs.